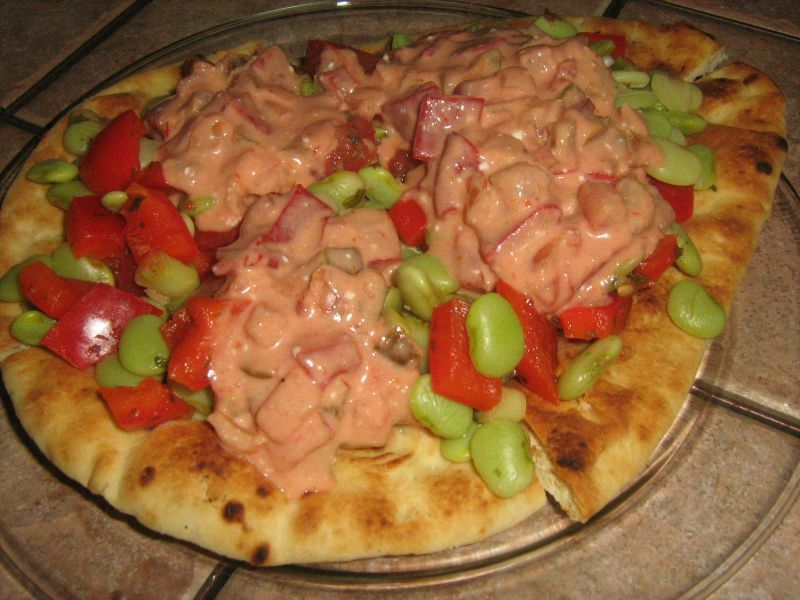 Limas and Salsa on Naan bread? Really? Hey why not? Now and again you probably find yourself with some leftovers. Why not use 'em up? Get creative. We did! this is what we came up with using some leftovers and other staples we still had. So tell us how you use left-overs. Have you come up with a creative recipe like the Limas and Salsa recipe? Why not share it with us. Simply submit your recipe and if you include a photo we will send you a copy of our eCookbook FREE! Cook lima beans according to package directions. When cooked, drain limas and return them to the saucepan. Add bell peppers, green onions, tomatoes, red pepper flakes, cilantro and sea salt and mix thoroughly. Add 1/4 cup water and reheat til heated through. Meanwhile, cut the Naan bread (2 per package) into quarters. Place it on a baking stone or cookie sheet and spray lightly with the cooking spray. Place in oven and bake for about 15 minutes or until the Naan begins to get crisp around the edges. While the Naan is baking and the bean mixture is heating through, using a small bowl, mix the salsa and Vegenaise together with the roasted red peppers and fold until combined. When the Naan is finished plate the quarters, two per plate. Top with the lima bean mixture and garnish generously with the salsa mix. Serve with fresh fruit and your favorite red wine.